In this short article I describe how to use Sphinx and Thinking Sphinx (v3) in a Ruby on Rails application to index the same ActiveRecord model with separate criterias using two indices. This article is not an intruduction on the open source search engine Sphinx and its Ruby library ThinkingSphinx but rather how to solve a problem I faced multiple times and not very well documented online. I will use a simplified example adapted from a real life application. A company has a web portal where users can view product representatives details. The company has a mangement console where admins can update the product representatives information. Both need to search the representatives data stored in a relational database table–and loaded in a Contact ActiveRecord object–but with different criterias. 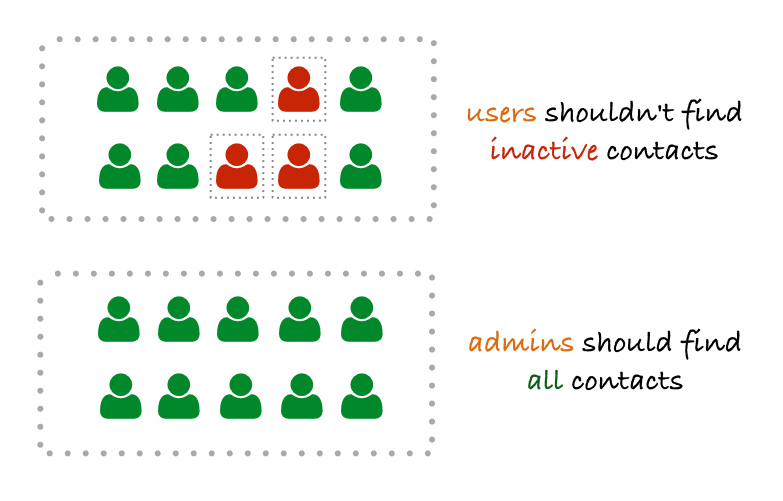 To make this example manageable I am defining only one criteria different between admin and user search: A user can’t see a contact that isn’t active but an admin can. You already know real life applications aren’t that simple–in real life there are likely a multitude of criterias different between admin and user search and this solution works there. # Only Piovani will come back because of the active filter. I think one disadvantage of this solution is to add an attribute to all non admin indexes to ensure they don’t conflict and also a second index increasing file size and potentially indexing time. The advantage is delegating to Sphinx the search rather then having specific search parameters set on search calls for each application portion–also this strategy can be shared by the other indices that need different search criteria between user view and admin. The described condition alone doesn’t justify the use of Sphinx or this strategy but in a real evolving application that is rarely the only condition that search runs on–this static attribute strategy has been a good fit when implementing search segregation.